Low alloy steels for high-temperature piping: C-Mo alloy steels, Cr-Mo alloy steels, and Mn-Mo or Mn-Mo-Ni alloy steels are regarded as steel for high-temperature applications. When high-temperature strength (creep strength) is the principal consideration, molybdenum content in the steel composition is usually increased. When high-temperature corrosion resistance is paramount, chromium content is increased. In the case of petroleum refinery equipment, which is subject to hydrogen attack, molybdenum and chromium are added to the steel to resist hydrogen attack. Low alloy steels are widely used at temperatures up to 600~650°C (1112~1200°F). Stainless steels for high-temperature piping: stainless steels are especially suitable for the temperature range of 600~675°C(1112~1247°F). For this temperature range, stainless steels not only maintain good creep strength but also exhibits excellent resistance to high-temperature corrosion, oxidation, scaling and carburization, and precipitation of secondary phases. Stainless steel 316 and its low carbon version 316L are most commonly seen in various applications. Newly-developed ferrous alloys for high-temperature piping: nowadays, new ferrous alloys are developed for use in nuclear, fossil and petrochemical industries. 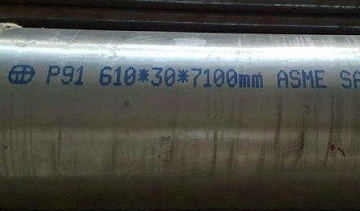 A 9Cr-1Mo-V alloy steel seamless pipe made in accordance with ASME SA-335 Gr. P91. 610 mm(o.d) x 30 mm(thk) x 7100(l). A typical example is the vanadium-modified low-alloy steel, 9Cr-1Mo-V. There are also niobium-modified stainless steels, and high Cr-Ni-Fe alloys. Alloying additions of vanadium, niobium, titanium and nitrogen have been effective in strengthening both ferritic and austenitic alloys.